A photo of the living conditions of a migrant worker on a North Carolina migrant worker taken by the Farm Labor Organizing Committee as part of their recent study. 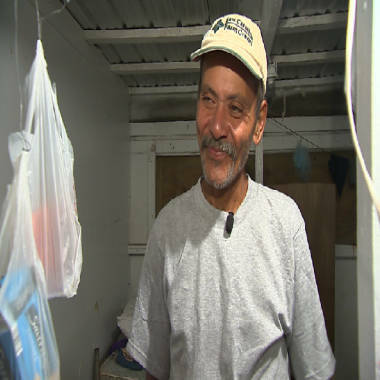 WILSON, N.C. – The lines on Celdin’s face and the dim look in his eyes make him seem at least 10 years older than his age, 53. They reflect the 12 long years the undocumented migrant worker from Honduras has spent laboring in the fields of North Carolina and doing construction in the United States. "Kneeling down is hard on my knees," Celdin said in a tired voice as he showed off the inflatable bed that he keeps on the floor. "But it sure beats getting devoured by bed bugs." He says he saved up to buy the plastic mattress that helps keep the insects away. Honduran migrant worker Celdin discusses the living conditions on a tobacco farm in Wilson, N.C. 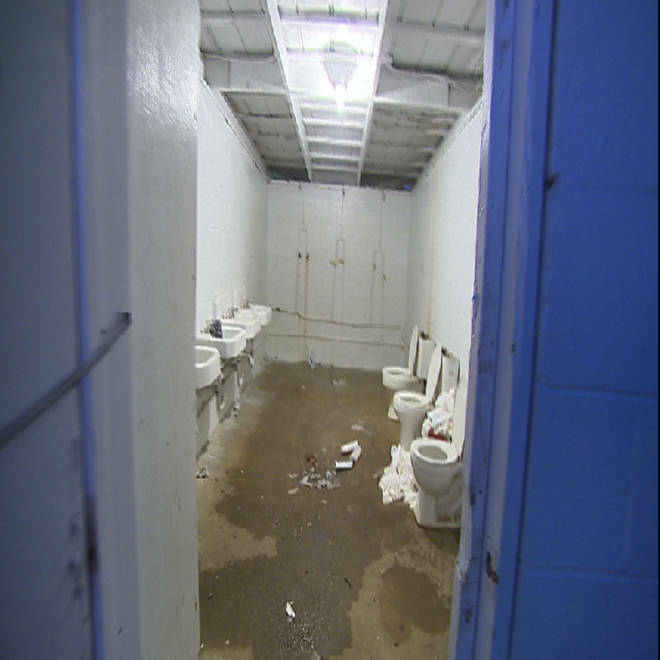 He wouldn't begin to describe the bathroom conditions at the labor camp in Wilson, N.C., that he shares with dozens of other workers. He wanted me to see it for myself. Walking in, one is immediately hit by a dreadful stench coming from a small garbage can on the floor that’s overflowing with used pieces of toilet paper. At the end of the room stand three showerheads with no curtains, and to the left, three toilets side by side, but without stalls or panels to provide workers any privacy. Celdin lives at a shelter for migrant workers provided by his employer, one of the many tobacco farmers in the state who sell their product to large tobacco manufacturers. We did not speak to the owner of the farm in Wilson regarding the living conditions of the migrant workers. They are reluctant to speak to the media, but can’t prevent reporters from coming onto the camp property since the workers pay a small rent to live there. So we come in as guests of the workers. 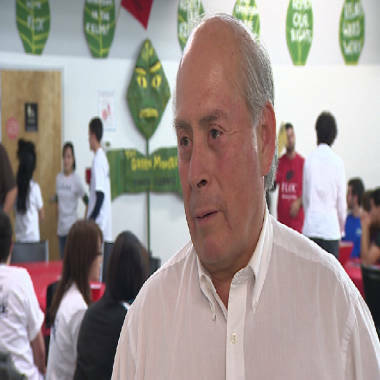 (Watch a Telemundo video report of the visit to the farm). North Carolina is the country's leading tobacco-producing state, and it's where the Farm Labor Organizing Committee (FLOC) and Oxfam America focused a recent study on the living and working conditions of tobacco field workers like Celdin. Among their findings was the fact that many workers live in rodent and insect-infested homes. One in four workers earns below the state's $7.25 minimum wage, while exposed to pesticides and tobacco-related illnesses. 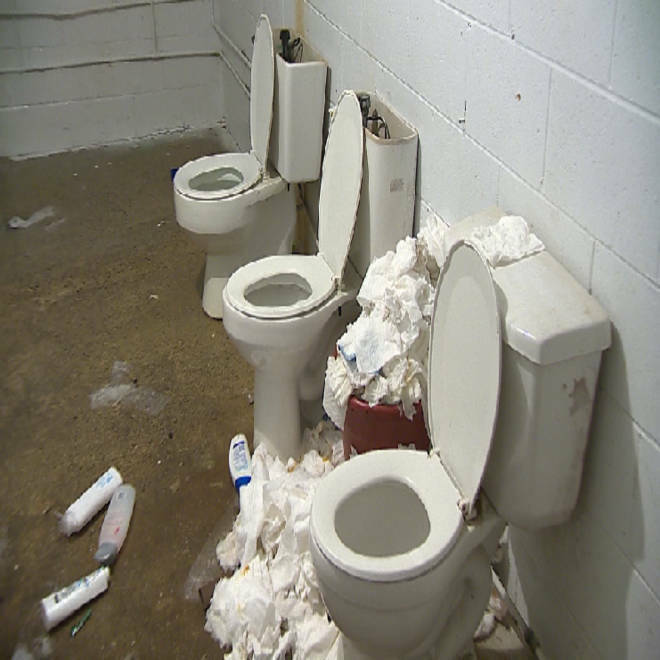 The bathrooms at the Wilson, N.C. tobacco farm. "Most agriculture work is very difficult on your body, but tobacco is particularly risky," said FLOC President Baldemar Velazquez, who claims workers are not provided the adequate protection against the effects of nicotine while handling tobacco leaves. Velazquez quoted another study done by Kentucky public health officials that showed on a single day a tobacco worker could ingest as much nicotine as if he had smoked an average of 36 cigarettes. "You can get severe symptoms [from the nicotine exposure], like the worst flu you've ever had,” said Velaquez, “uncontrollable green vomit because of the nicotine coming out of your body." Jose, a migrant from Mexico, who is also an undocumented worker, has been in the U.S. for five years. He recalled how a friend lost his job and his home when he showed symptoms of tobacco-related illness at work. A view of the filthy living conditions at the tobacco farm in Wilson, NC. "He started vomiting and passed out,” Jose said. Once the boss saw the ill worker, according to Jose, he said, “’He's no good, I can’t have him around anymore,’" and the worker lost his job. When it rains, conditions take a turn for the worse. To protect their skin from the nicotine-contaminated water, workers will cover themselves with plastic bags, but that can compound their discomfort during the harvest, when temperatures may rise above 100 degrees. "The heat is unbearable," said Celdin. He added that on the hottest days he might go without water for more than an hour. "I thought I would die once, many die in the fields." Jose, a Mexican migrant worker, talks about some of the illness workers get from nicotine exposure. Those conditions have driven Velazquez, the son of a farm worker, to defend the rights of migrant workers since he founded FLOC in 1967. "Here’s a cycle of exploitation that is triggered by the inequities in the supply chain designed by the tobacco companies,” he said. “Farmers use undocumented workers because they're cheap and they work hard and they're afraid.” Most are afraid of getting deported – 90 percent of the workers interviewed for the study are undocumented. "We seek a better deal for the workers and the farmers by getting the tobacco companies to sit at a table, and say look, this is what it’s going to cost to clean up these nasty labor conditions, these nasty labor camps and make it possible to bring legal workers." Farm Labor Organizing Committee President Baldemar Velazquez discusses the conditions of migrant workers on tobacco farms in North Carolina. Companies like RJ Reynolds, Philip Morris International, Philip Morris America, and British American Tobacco have expressed a willingness to take part in multilateral talks to address the issues. In the meantime, men and women like Celdin will continue to take whatever work they can get. A version of this report was first broadcast on Telemundo.